Taylor took the path less traveled on her journey to North Carolina. Originally from Indiana, she spent the warm months, as a child, catching frogs in the creek and swimming in Lake Maxinkuckee. Taylor grew up watching Shark Week with her Dad, and any other ocean-related documentary she could find. Over the years, Taylor’s fascination with the sea has developed into a passion for coastal conservation and marine science education. Taylor fell in love with camp when she started in 2011 as a counselor at Culver Military Academy, a residential camp focused on leadership development. It was here Taylor realized that experiential education was the career path she wanted to pursue. Before relocating to North Carolina, Taylor spent a month in South Africa studying great white sharks in Mosselbaii alongside world-renowned shark biologist, Ryan Johnson. Continuing to combine her passion for marine science and coastal conservation, in 2014 Taylor joined the Sea Turtle Camp family for the first time as an in-field Marine Educator. 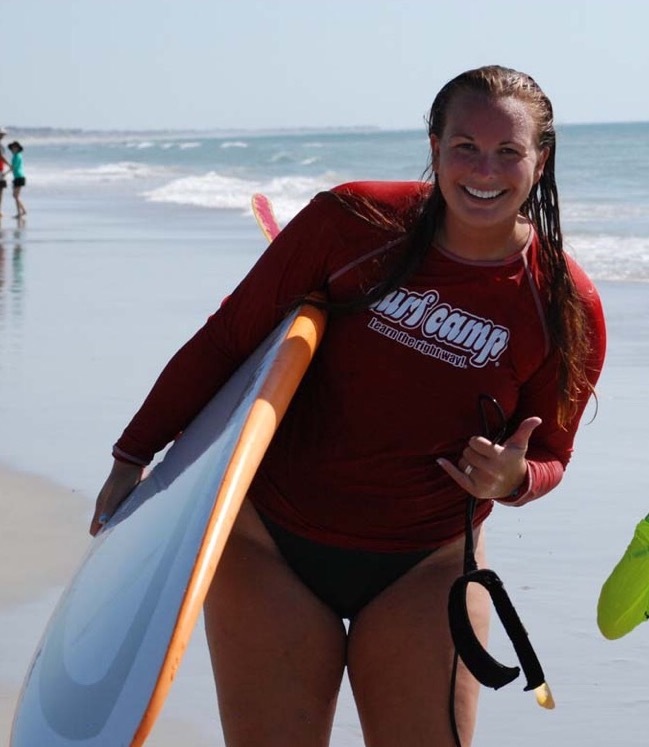 She returned for the 2016 season as the Kid’s Camp Director for our sister camp, WB Surf Camp. In addition to her camp experience, Taylor holds a degree in International Environmental Studies from UNCW, holds and American Red Cross Lifeguard Certification, and is PADI SCUBA certified. She also continues to feed her fascination with sharks as the Education Ambassador of North Carolina for OCEARCH, the global white shark tagging organization. When Taylor isn’t on the beach or in the field, she’s at the barn with her two horses Jackson and Blue. We are so excited to have Taylor back and with us full-time!